Initially, our clients see the obvious financial savings as the prime benefit of our Managed Print Services program. By eliminating the frustrations of managing printer repair, supply orders and document quality control, our clients realize higher productivity, focus and morale. 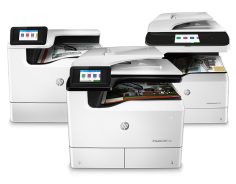 Since we can manage your existing fleet of printers regardless of brand, no capital investment is required. You only pay for the prints you use. Consolidating vendors also reduces the cost of processing invoices for multiple vendors. We have found that managing an output fleet typically yields savings ranging from 7% to 15%. The examples below show how that translates into dollar amounts for companies with annual revenues of $10 million and $50 million. Identify problem areas, including departments and employees with excess waste Reduce the number of calls to your help desk, increasing quality of response while reducing wait time Increase moral with a smoothly running document production environment. Realize significant reduction in costs Keep printing quality and production time at optimum levels.